From the beating heart of our gateway city Madrid to the small-town charm of Bonansa, set in the foothills of the Pyrenees -- you will revel in gorgeous trail runs, inspiring encounters with nature and people, and the luxury and hospitality of ecohotel Terra Bonansa. This is the trip you deserve. Just say YES! and we’ll take care of the rest. registration is now open, space is limited! Our adventure begins when we gather at Petit Palace Savoy Alfonso XII hotel in Madrid for an official meet & greet. After introductions and orientation, we’ll get acclimated by heading out to savor the sights and delicious tastes of the San Miguel Market. Then we’ll return to the hotel, where you’ll have time to rest and freshen up before we take in one of Madrid’s famous Flamenco dinner shows. Overnight at Petit Palace Savoy Alfonso XII, Madrid. After a short morning run through Madrid’s lush and historic Parque del Retiro, we’ll have breakfast near the hotel, and then head to Madrid’s AVE station as a group to board a high-speed bullet train for our 2 hour ride to Lleida. We’ll be met at the station by our driver and begin our journey to the mountain village of Bonansa, population 50. Upon arrival, we’ll hike up to the 11th century Hermitage de San Aventín and enjoy a sunset wine and cheese reception overlooking the village hillside. This begins our week-long stay at Hotel Terra, a family-run boutique eco-hotel that we will have all to ourselves, nestled in the lush hills of the Pyrenees. You’ll have plenty of time to freshen up, relax or take a dip in the spa plunge pool before enjoying the first of our several, locally-sourced gourmet dinners at the hotel. 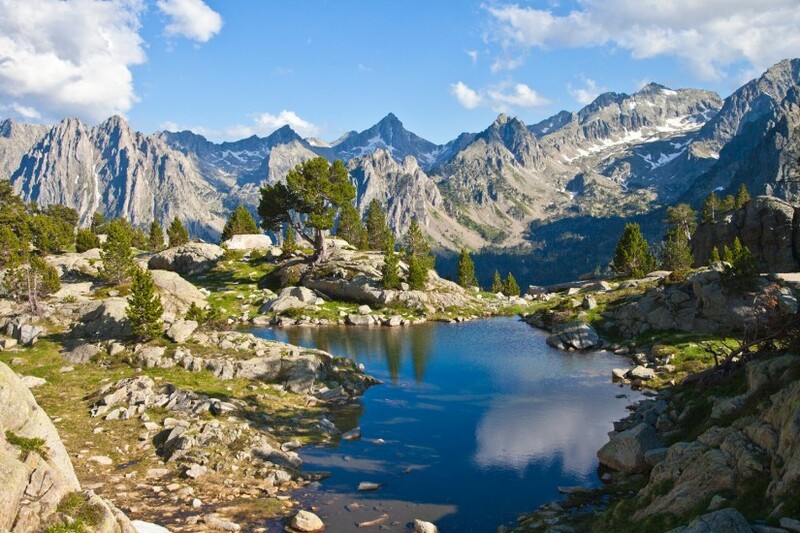 After breakfast at the hotel, we’ll take a short drive to the mountain village of Boi, where we’ll board the Aiguestortes i Estany de Sant Maurici National Park shuttle to the trailhead. We’ll cover up to 17K (with options for less) as we make our way through the park. We will share a delicious lunch in the park at the Estany Lolong Hut, where many adventurers have come before. Afterwards, we’ll enjoy a tour and viewing of the groundbreaking video-mapping project of the amazing World Heritage Romanesque architecture of Sant Climent de Taull. As the sun sets, we’ll imbibe in well-earned afternoon refreshments at Tribulosi Bar, and enjoy a local meal en route back to Bonsansa. After breakfast, we head to the trailhead for our run up the gorgeous El Turbón. We will enjoy amazing views just a few miles into the fun, which will stay with us for the rest of the day. A yummy streamside picnic will await us upon our descent. We’ll return to Bonansa with time to relax, take in village sights and sounds (Look...a flock of sheep!) or a soak in the plunge pool before we enjoy dinner as a group overlooking the verdant countryside, with star gazing to follow. After breakfast at the hotel, we’ll be driven to the trailhead at Congost de Mont-rebei, a deep gorge formed by the Noguera Ribagorçana river, that will treat us to stunning views through an ecological paradise. Today you will find yourself traversing a breathtaking cliff-side 5K of winding trails etched out of the side of rock. We’ll be high above the river canyon and run through tunnels and over suspension bridges, and a thrilling cantilevered staircase. At the end of our run, kayaks will await us and we’ll begin our paddle (with time for swimming!) back to the trailhead. We’ll have time for a swim followed by an awesome lunch. *Anyone wishing to hang back and relax, can choose to spend today lounging, reading, napping and sunning by the Bonansa town pool. Tonight, our chef, Maribel, will treat us to a private cooking class. We’re giving our legs and lungs a break from running today, and instead using our swimming skills. 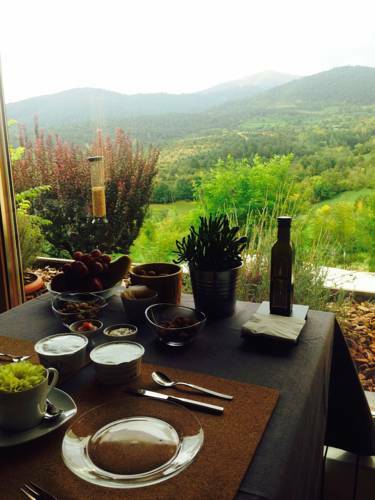 After breakfast we will drive to the Viu ravine situated in the Pallars. Today is about adventure and here we’ll swim, jump, slide, swing and abseil through an amazing series of flowing waterfalls throughout the canyon with our local guides. Following a picnic lunch, we’ll head back to the hotel to freshen up and then we’ll tour Xarxa Parc de les Olors, the “park of fragrances,” an organic farm focused on the cultivation of aromatic, culinary, and medicinal plants and herbs. You’ll have time to explore and shop, before we we end up in Vilaller where we will enjoy a casual supper at a local family restaurant. 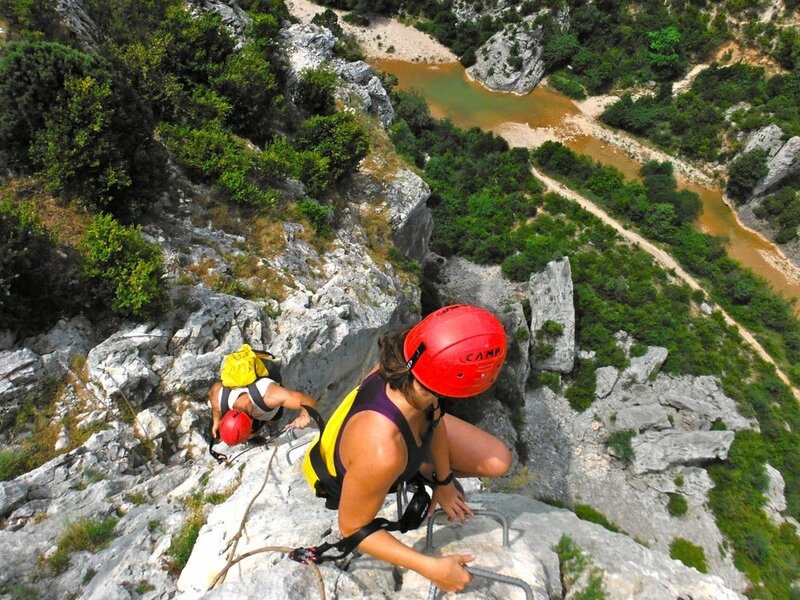 After breakfast at the hotel, we head to nearby Calvera to embark on a classic Pyrenees “via ferrata” or "by way of the iron" climbing adventure, with stunning high aerial views as a reward for our efforts. We’ll return to Bonansa to rest, freshen up, and enjoy an outdoor dinner as the sun sets. Tonight we celebrate las Fallas de San Juan in Bonansa, which is one of only 60 villages to still practice this ancient summer solstice ritual. We are all are invited to carry a torch of purifying fire, which burns the "follies" of the previous year, providing a fresh start, and is believed to give force to the sun for the remaining days of the year. We’ll carry our torches into the Plaza Mayor, where a large bonfire awaits, along with music, dancing, traditional cake and wine. During breakfast we’ll officially close our week of running, adventure and connection, before we transfer to Llieda, where we catch the high-speed train back to Madrid (or Barcelona for those going on their own adventure) for departing flights the next day – Monday, June 24. We are happy to help you arrange hotel and transportation arrangements as needed in either city. $4250 AFTER APRIL 1 - save $250 when two or more friends sign up together! Women Who Run the World swag bag-of-love from our sponsors and MORE! We will be based in the lovely village of Bonansa (pop. 49), in the verdant foothills of the central Pyrenees. This magical region boasts quaint villages and historic towns, rolling hills, rushing rivers, Romanesque architecture and rocky mountaintops. The weather in mid-June is the perfect temperature for adventuring, typical for early summer in the mountains with cool nights and warm days. High temperatures are in the high 70s, lows in the high 50s. Expect mostly sunny days, but we’ll check the weather along the way so we’re prepared for rain or a drop in temperature. This area of Spain abounds with beautiful trails for hiking and running, which are generally well-marked and maintained. We will enjoy a wide variety of trail conditions, from well-packed dirt trails to more technical rocky sections, and we’ll adjust our pace accordingly. Many of the trails are unshaded so a running hat and sunblock are important items to pack. Most of all, our local guides have chosen our routes for their stunning views, so prepare to soak up the beauty of this unique area on each and every run. Spanish cuisine varies by region and is heavily influenced by the local culture and history. Our first taste of Spanish food will be in Madrid at the Mercado de San Miguel, where there are options for feasting on a sampling of typical Spanish flavors including dried meats, cheeses, seafood, simple but delicious padrón peppers, paella and many other tasty bites. For the rest of our trip we will be based in Bonansa, located in the Aragon region close to the French border. Here we will enjoy exquisite meals lovingly prepared by Maribel, in the tradition of Spain with the attention to detail of French cuisine, in addition to sampling a few local restaurants. One evening we will enjoy a hands-on paella cooking lesson with Maribel, and then enjoy the fruits of our labor in the lovely garden at our EcoHotel. You will not go hungry and we can accommodate for any type of food preference or sensitivity. REGISTRATION FOR PROJECT CONNEXIO 2019 IS NOW OPEN! $1000 deposit due at time of registration. Total balance due by April 30th. Space is limited. Group size is limited to 8. See our FAQ page for details on our cancellation policy. Single occupancy can be arranged for an additional cost.